Driftwood is an acoustic album which embraces “new acoustic” country, bluegrass and folk music. The songs that I wrote for this album range from toe-tapping tales of innocence and corruption to intimate ballads of love and reflection. There is also an instrumental bluegrass breakdown by Ced Thorose. I am thrilled that film producer Adam Mason has picked two tracks from the album to feature in his new film, Dust, which is scheduled to go on general release following the Cannes Film Festival in the spring of 2002. With harmonies by Charlie Boston and Laurie Harper. Here is a trio of compact discs by members of England’s Charlie Boston Band along with several guest musicians. Apparently, several selections from these productions have already received extensive airplay from country disc jockeys throughout Europe. The music of the group can best be described as contemporary folk music with distinctive bluegrass overtones. “Driftwood” and “Truths & Fantasies” feature a total of 25 selections mostly written by Charlie Boston. “Driftwood” features a trio of musicians (ie Boston, resonator guitarist Ced Thorose and fiddler/mandolinist Laurie Harper) and emits a distinct folk flavor, while “Truths & Fantasies” engages a seven piece group and has a more rounded bluegrass sound. Charlie Boston handles the lead vocals and displays a laid-back delivery. He is also a creative songwriter with such titles as “Black Smoke Risin’, “The Bright Lights of Town”, “Maybe I’m a Dreamer and “Cabin on the Hillside”. The third member of this CD triad is “Diamond Back”, a solo project by resonator guitarist, Ced Thorose, whose instrumental approach is comparable to Junior Barber. The CD’s title comes from the trade name of resonator guitars hand-crafted by Thorose. The 14 selections are a blend of instrumentals and vocals including “Only Our Rivers Run Free”, “Another Night”, Tennessee Fluxedo”, “Lakes of Pontchartrain” and “Gold Rush”. Also present are Thorose originals including “Owentocker”, “N19″, May Blossom” and “C Waltz”. From what is presented in these three compact discs, it would well be worth a trip to England to catch Ced Thorose and the Charlie Boston Band at one of their live performances. I am totally hooked on Charlie Boston’s highly characteristic style of country music but, until last year, had never heard of him. Were it not for my introduction to Traditional Music Maker magazine, there would still be a Boston Band void in my life. When I listen to some of the unholy schlock posing as country music and churned out by a seemingly endless army of half-assed karaoke club acts, I offer up a prayer of thanks for such as Charlie Boston. 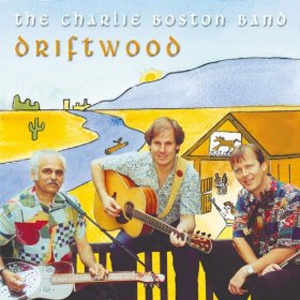 “Driftwood” was produced in 2000 and features some superb acoustic instrumentation from Charlie’s band who, for this collection of songs, featured Ced Thorose (resonator and slide guitar), Laurie Harper (fiddle, mandolin, bass and vocal harmony) and Charlie himself on guitar and lead vocals. So tight and accomplished are these three musicians that the absence of heavy percussion slips by unnoticed and would have been burdensome anyway, given the nature of Charlie’s excellent songs. Marketing music of this high calibre is never easy and one hopes that Charlie is able to secure enough gigs in order to sell his wares and that his advertisements in TMM result in exposure on a generally overcrowded scene. If record buyers were a little more discerning in their purchasing habits, eschewed some of the less than worthy Nashville albums and gave more credence to such as Charlie Boston, the UK might have a healthier country music scene. As it stands, Boston is an artist with two CD’s to be proud of – the second being “Truths & Fantasies”, which also comes highly recommended by all at TMM. – Bryan Chalker, Radio Presenter and Consultant to the British Archive of Country Music. Charlie Boston introduced himself to me via his self-penned 12-track album Truths & Fantasies. After hearing it, without hesitation it was My British Album Of The Month. Now comes his follow up 13-track album Driftwood and the excellent news he has formed his own band. Before entering the recording studio they decided Driftwood should have less of a bluegrass feel, so the banjo was omitted to give more space to the resonator guitar (more commonly known as dobro, its trade name) to produce an album with a ‘new acoustic’ sound. This has been fully achieved in my opinion. Of the 13 tracks only one ‘Memories’, a beautiful ballad, is co-written. The other 12 are by Charles Boston proving he is a prolific composer and there is a wealth of instrumental sounds and wonderful meaningful lyrics to sate any music lover’s appetite. If I was pitching songs for this artist ‘The Bright Lights of the Town’ would certainly be aimed at Joe Brown. I could hear a very commercial pop version by that artist. ‘Little Red Dog’ is an instrumental track of high-quality picking and perfect step in step out instrument timing. It is a tribute to a little dog and the many happy hours spent together. Sadly, the dog is no longer there but not forgotten. For line dance choreographers ‘In a Mexican Mood’ should be right up your street and what a great title for a dance. This is an album the more I hear the more I could find to write about. Should you be an organiser of musical events I cannot recommend this band highly enough, they will grace any stage you can think of and that includes the Grand Ole Opry as far as I am concerned. Here are three musicians I would back against all corners and submit this fine quality album Driftwood as evidence. As a reviewer, I enjoy listening to many hours of music. When an album of original music like this one comes out of the blue containing that rare magical sound of instruments actually talking to each other then harmonising it sends shivers down my spine, a sensation I only get when something is very special. C.B. is the artist’s initials. Breaker, Breaker pull the handle down and tune in to this album. My Brit Album Of The Month. What a delightful album, bluegrass at its best, melodic, beautifully sung and the instrumental work is brilliant and so fitting the moods of the songs. There are no lows, I enjoyed every song, but my picks were the gentle “As the sun goes down”, the waltz “Aurora”, the thoughtful “Blue misty mountain” and a lively instrumental “Little red dog”. The players are Charlie Boston Boston, guitar lead and harmony vocal, who also wrote all the songs, except “Memories”, which he co-wrote with Trish Davy, and Little Red Dog, which was composed by Ced Thorose, who plays resonator and slide guitar, and Laurie Harper on fiddle, mandolin, bass and harmony vocals. The song lyrics are in the sleeve and they tell some wonderful stories. A very talented trio indeed. A superb album, made in Britian! The Charlie Boston Band, Boston (lead and harmony vocals, guitar), Cedric Thorose (resophonic and slide guitars) and Laurie Harper (fiddle, mandolin, bass, harmony vocals) are probably the best bluegrass outfit in Britain, though on Driftwood (Lara), the guys have a more country folk feel. This is not a criticism. The album, with 12 of Boston’s songs and one Thorose instrumental, is absolutely first rate. Boston has a voice more akin to folk than bluegrass anyhow and he does a first rate job with these excellent originals. This slice of middle-of-the-road country pie, served up by the London-based Charlie Boston Band is a delight. The toothy crispness of the sound from engineer Joe Leach at Hackney’s The Premises Studio is exemplary in its unfussy but rich quality. The country twang of Cedric Thorose’s slide guitar, and laurie Harper’s high lonesome fiddle, bright mandolin and rock steady bass perfectly compliment Boston’s strong lyrics, engaging voice and mellow guitar. The opening track, “Billy rode to town” is a classic tale of an innocent in the city, shot in a card game, and it’s perfectly delivered. But that is the only piece of real “costume drama” on the disc. Other songs find ways of making, say, a jailhouse song, or a train song, metaphorical for contemporary experience. Although many of the tracks are quite introspective (“Memories”, “As the sun goes down” and “That soft look in your eyes”) overall this is a very feelgood record. This is partly due to the tone-setting third track, “In a Mexican Mood”, which though it is ostensibly set in San Jose clearly offers what could be a vignette of the singer enjoying Mexican food and wine in his London garden, as he mulls over a break-up and eyes up a pretty neighbour. The song, with its self-deprecating anti-hero’s voice, is sheer sunshine and the cleverest lyric on the disc. I almost wished more songs here adopted that kind of explicit genre form – when the singer addresses us more directly, the words just occasionally approach versified truism. But all the numbers in the collection give the listener much to enjoy. The concluding “Aurora” plays on the girl’s name in promising a dawn after the darkness; in the “The Bright Lights of the Town” Boston shows nice use of masculine and feminine line endings) on the on-beat or the off-beat); and in “That Soft Look in your Eyes” he looses a rhyme internally in one line at a perfect moment: “The night seems long and dreary / and even though I’m weary I can’t sleep”. I’ll be chasing down this album’s predecessor, Truths & Fantasies which was the band’s acclaimed debut. Meanwhile the one instrumental cut on Driftwood, a lovely, freewheeling, bluegrassy piece by Cedric Thorose entitled “Little Red Dog”, leaves one wanting a whole disc from that man too”. Now firmly established as Britain’s number one acoustic/bluegrass outfit, Boston (guitar, lead and harmony vocals), Cedric Thorose (resonator and slide guitars) and Laurie Harper (fiddle, mandolin, bass and harmony vocals) turn in a cracking performance on 12 Boston songs and one neat Thorose instrumental. Not your usual traditional bluegrass but nevertheless a beautiful acoustic sound. Check out In a Mexican Mood, Black Smoke Risin’, Blue Misty Mountain and Billy Rode to Town.